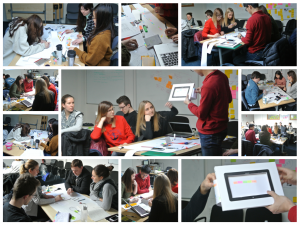 Students undertaking CS5042 User Centred Interaction Design were pictured prototyping their design ideas during creative thinking, and hands-on sessions earlier this month. UCID provides experience with modern design methodologies, introduces the philosophy of interaction design and involves working with actual clients. The module delivered by Miguel Nacenta is a compulsory element for students studying on our MSc in Human Computer Interaction, a popular addition to our MSc Portfolio.